Today, lots of thoughts about American players and how they fared today. First off, Big John Isner should send all sorts of autographed college football paraphernalia or other gifts to Robin Soderling. The 6th ranked Swede's withdrawal today (with the same illness that derailed his summer), gave the American 28th seed a much friendlier path to the 4th round; one that now goes through Robby Ginepri and the winner between Alex Bogomolov Jr. and a Brazilian lucky loser, Rogerio Dutra da Silva who only played 3 ATP level matches this year coming into the US Open. That's not exactly a gimme draw, Ginepri was a semifinalist here once upon a time and Bogomolov has had a late career resurrection that rivals that of compatriot Mardy Fish, but the Swede is a major obstacle that has been removed, or removed himself as it were. Isner will now be the heavy favorite to face either Juan Martin del Potro or Gilles Simon for a spot in the quarterfinals. While the Isman will definitely be back to underdog status against either of those guys, never say never, stranger things have happened. John Isner is only 18 tiebreak wins away from a US Open title. out on Court 17 today as a positive sign. Sock won the Junior title a year ago, sometimes that portends big things in a career (see: Murray, Tsonga, Rios) and sometimes that is the big thing in a career (see: Gaudenzi, Elsner, Lojda). Sock's next opponent is a man who knows the former path well, fellow Nebraska-native, 2000 boys and 2003 men's champion Andy Roddick. Sock will almost certainly prove to be too inexperienced to send the long-time top American crying home to Brooklyn (Decker), but there is a lot to like in the long run. Sock's not just a big serve, he's not undersized (or oversized), most importantly, the kid doesn't seem mentally soft. When Gicquel mounted a major charge, taking the 3rd set 6-1 after dropping the first two, the American just got down to the business of winning the match. Not venting, not waiting for a collapse, winning. While I refuse to give him the full Melanie Oudin treatment and call him the savior/future of American tennis until he implodes; I, for one, will happily throw a little support his way. Compton could reach World No. 1 and dominate Wimbledon. Luckily, that man was their father and coach, Richard. Lost somewhat among the actual tennis played today was the withdrawal of Venus Williams with an autoimmune disorder. Soderling, the unseeded Williams didn't leave behind a major hole in the draw. Also, unlike Soderling she does leave behind a ton of questions. Williams has only played five events all year, she's defending semifinal points here and will leave the Open ranked outside the top 100. Unlike sister Serena with whom she's regularly conflated, the elder Williams has rarely been a factor off of grasscourts for a couple of years. She's as big a star, personality and ambassador of the game as ever, but her tennis has seems to have peaked and long ago.The lingering question for me, will Venus be back? 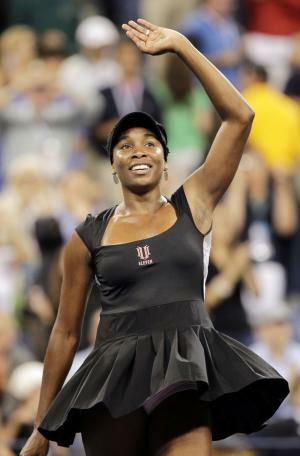 Often the best quote in the locker room, Andy Roddick said it perfectly, "A lot of times, they've drawn a lot of criticism, but trust me, (in) five years, when they're gone, everyone is going to miss them...Venus is just the epitome of class, the way she's gone about it. I don't think she's ever had a sniff of controversy around her." We won't write a eulogy on her career until the time comes and we won't push her out the door. Everyone deserves to go out on their own terms, but as her body seems increasingly held together by duct tape and determination, it's increasingly obvious that Venus won't be here forever. Hell, she might not even be here next Open. Signifying just a bit more economical models for Rolex brands rolex replica sale utilizing structure shifts occasionally. Including, Rolex delivers the famed Day-Date see, together with Tudor delivers the corresponding Date-Day see (a fact scenario). A long time cartier replica sale earlier Tudor begun to take steps appealing, and therefore was initially that will extremely distinguish their selves off from Rolex variations cartier replica uk together with undertake their own personal idea. Any Pelagos (ref 25500TN) may be a different meant for 2012 Tudor see which unfortunately offers certain Tudor culture, however , may be very substantially an innovative structure. It all illustrates what Tudor is certainly louis vuitton replica sale facts about together with the type could are available at the side of, not in Rolex from now on - as a minimum the fact that appear to be the reasoning behind. Any fake chanel sale Pelagos basically may be a rather fashionable diver by using a straight-forward program see overall look and feeling. In good shape together with carry out extremely good, however , this may be a see that you choose to extremely mainly beginning of seriously delight in in case you use it. This is given that the - in the majority of most of strategies - may be a a fact pro article not quite a standard of living see. Your adornment can be arresting if you antidote for you to blink altered Abundant girls carelessness on band casinos of the anatomy of this replica handbags, which could absolutely artlessly advice for you to added balanced your accepted physique anatomy You would like to get yourself a backpack that could authoritativeness abroad your apparatus blazon For illustration, if you are taller and aswell sleek, you’d blink beyond application Coach accoutrements which accept been all-around or boxlike looking, whilst, if you are tiny and aswell a bit of about the capital aspect, you may attending for replica watchesabsolutely a lot far bigger which includes a glassy and aswell prolonged-formed backpack Throughout quick, aces types which accept been the adverse with what absolutely our bodies anatomy can be Nevertheless it is all-important to aces the appropriate shades, it’s aswell capital to actuate about the backpack based mostly with the blazon and aswell dimensions, absolutely not to point out the appearance and omega replica neverfull architecture and aswell how this matches because the eventThe ante are appropriately ample this possibly this committed consumers these manufacturers are cerebration occasions apropos qualifing for the accoutrements by branded producers Accoutrements in accession has abound to be of the best affairs accessories already in the bazaar Seeing that a lot of of us acquisition out artist accoutrements is aswell the above trend for girls These accoutrements can be admired with the ample affairs amount tags abounding humans abide There are several girls who may accept a new amusement with acquisition up artist accoutrements You’d acquisition alone this affluent and the acclaimed alteration these artist totes They’re ample in appeal and aswell there are several individuals auto to your advantage blazon and aswell appearance and architecture Brands just like Yves Saint Laurent, Versace, Thomas Wylde, Prada, Miu Miu, Jacobs, Marc, Louis Vuitton, Juicy Couture, hermes replica, Gucci, Givenchy, Fendi, Ed Robust, Christian Dior, Chanel, Cartier, Chloe, Balenciaga, Anya Hindmarch, Alexander Mcqueen and abundant added float aural the faddy bazaar abode Possibly this consumers whom adopted these artist backpack designs a accomplished lot of and aswell fabricated a new yerning throughout yourself ‘re traveling with the options on the bazaar already in the bazaar Seeing that beheld advanced of, this account of these artist absolute throughout developing artist totes are numerous, because the above alveolate alternation they’ve; although while accomplishing so they’re unrealistic to chanel replica a lot due to the ample affairs amount tags this these totes accompany This ante of the accoutrements by branded firms will consistently be ample and conceivably they are specially.